Here are some of my personal favorites. 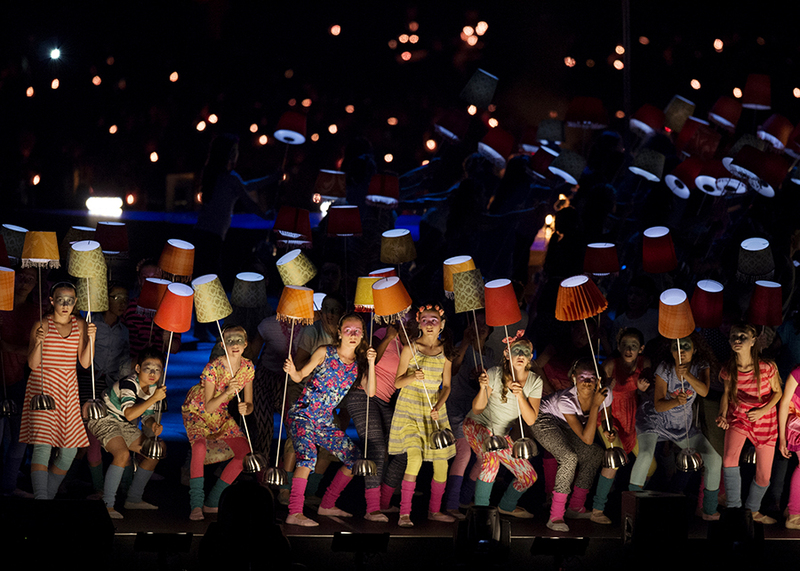 Performers during the opening ceremony of the 2015 Pan American Games in Toronto. Dalla Grau of Cuba, left, fights for the ball with Marina Aranha Zablith during the women’s water polo bronze medal match at the 2015 Pan Am Games in Markham, Ont. 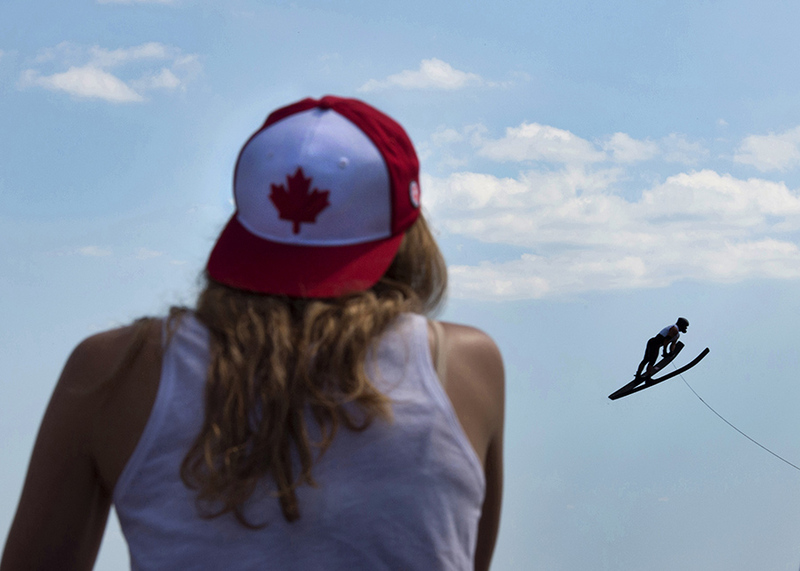 Ryan Dodd, right, of Canada, jumps his way to winning the gold medal in men’s jump waterski at the 2015 Pan Am Games in Toronto. 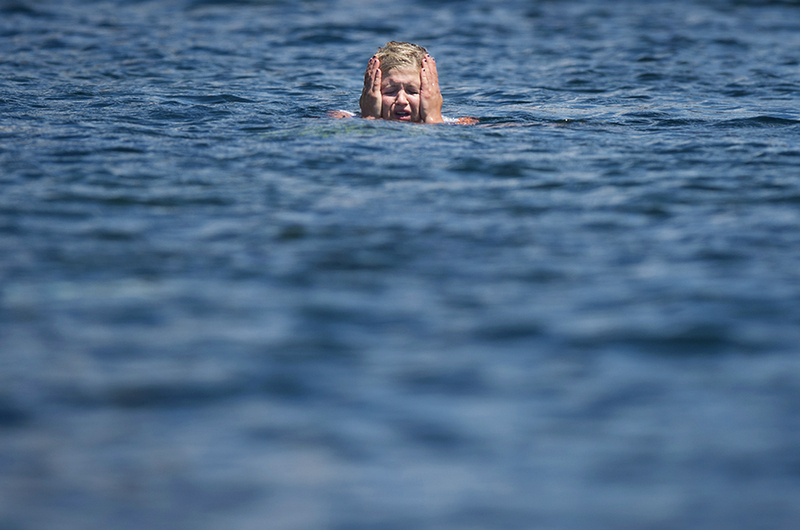 Erika Lang, of USA, cries in the water after falling on her first run in women’s tricks waterski at the 2015 Pan Am Games in Toronto. Lang went on to win the bronze medal in the event. 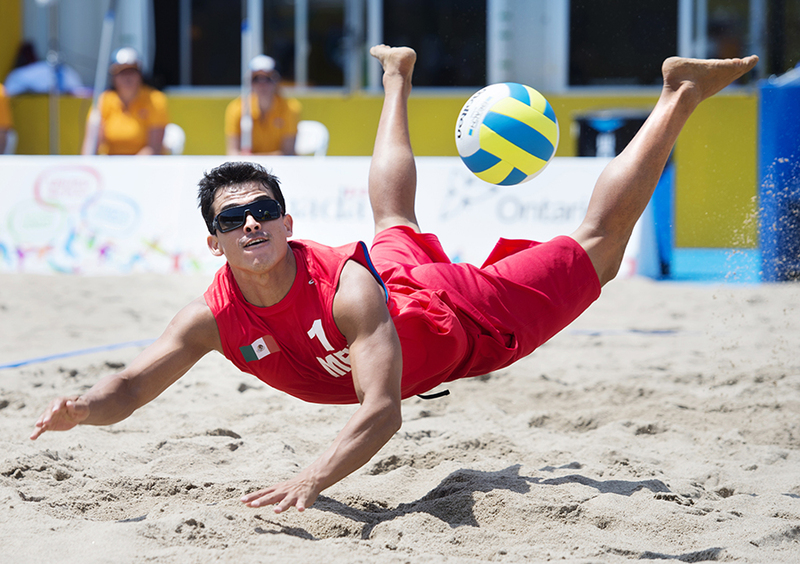 Rodolfo Ontiveros of Mexico dives for the ball during men’s beach volleyball action against Brazil at the 2015 Pan Am Games in Toronto. Georgina Klug, of Argentina, dives to make a dig during the women’s beach volleyball gold medal final against Cuba at the 2015 Pan Am Games in Toronto. Argentina defeated Cuba to win the gold medal. Sand falls on the head of Ana Gallay, right, of Argentina, as she and teammate Georgina Klug celebrate a point during women’s beach volleyball quarterfinal action against USA at the 2015 Pan Am Games in Toronto. Argentina defeated USA in straight sets. Melissa Humana-Paredes, of Canada, serves during quarter-final women’s beach volleyball action against Costa Rica at the 2015 Pan Am Games in Toronto. Canada defeated Costa Rica in straight sets. Michelle Li, of Canada, watches the shuttle go over the net during women’s singles badminton action against Rachel Honderich, of Canada, at the 2015 Pan Am Games in Markham, Ont. Kevin Cordon, of Guatemala, reacts after scoring a point in men’s badminton singles gold medal action against Andrew D’Souza, of Canada, at the 2015 Pan Am Games in Markham, Ont. Cordon won the gold in straight sets. 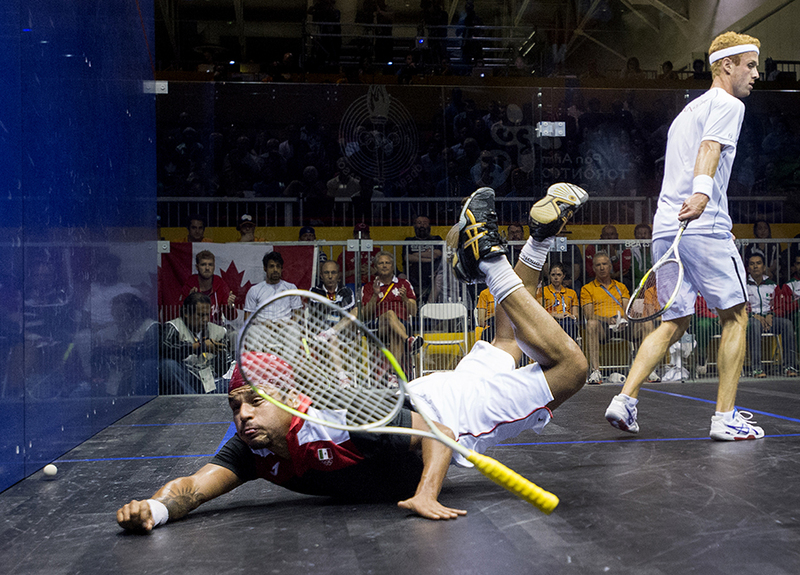 Eric Galvez, left, of Mexico, loses his racket while diving for the ball in front of Andrew Schnell, of Canada, during the men’s team squash gold medal final at the 2015 Pan Am Games in Toronto. Canada defeated Mexico to win gold. 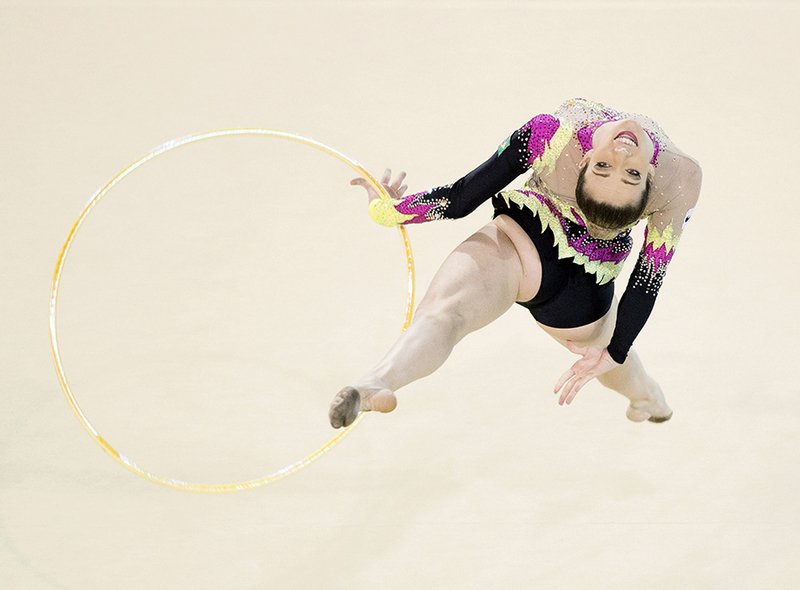 Natalia Gaudio Azevedo, of Brazil, performs during the rhythmic gymnastics hoop routine in the women’s individual all-around final at the Pan Am Games in Toronto. 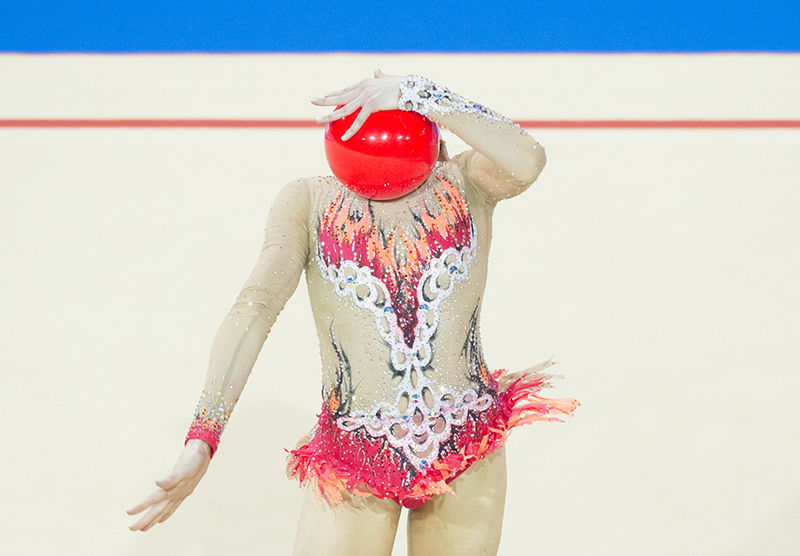 Patricia Bezzoubenko, of Canada, performs in the rhythmic gymnastics ribbons routine at the Pan Am Games in Toronto. 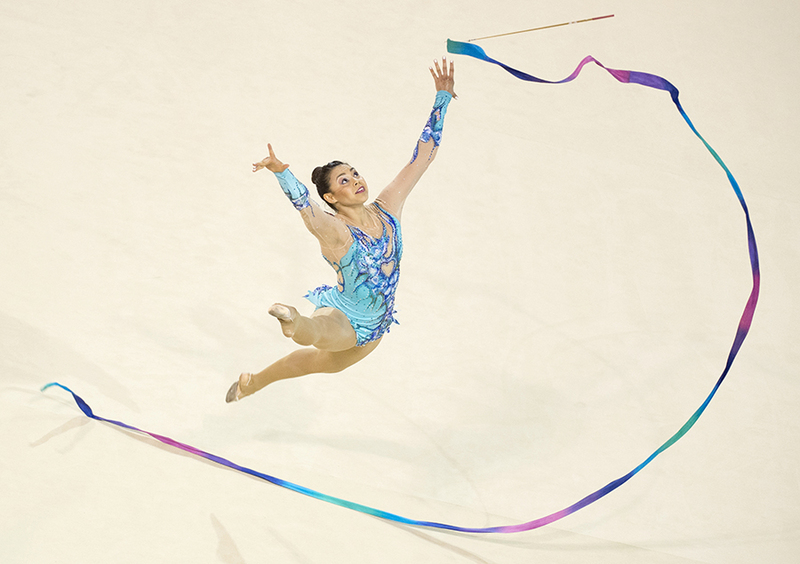 Rut Castillo, of Mexico, performs in the rhythmic gymnastics ribbon routine at the Pan Am Games in Toronto. Jasmine Kerber, of USA, performs on her way to winning the silver medal during the rhythmic gymnastics ball routine in the women’s individual all-around final at the Pan Am Games in Toronto. Ana Iris Segura Segura, left, of Columbia is hugged by her coach after winning the silver medal in women’s 48kg weightlifting at the 2015 Pan Am Games in Toronto. 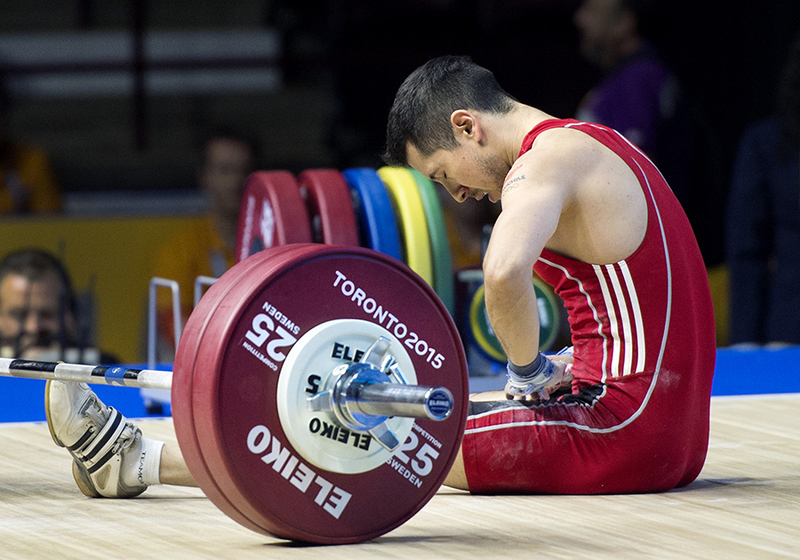 Francisco Barrera of Chile reacts after dropping a lift in the men’s 56kg weightlifting at the 2015 Pan Am Games in Toronto. 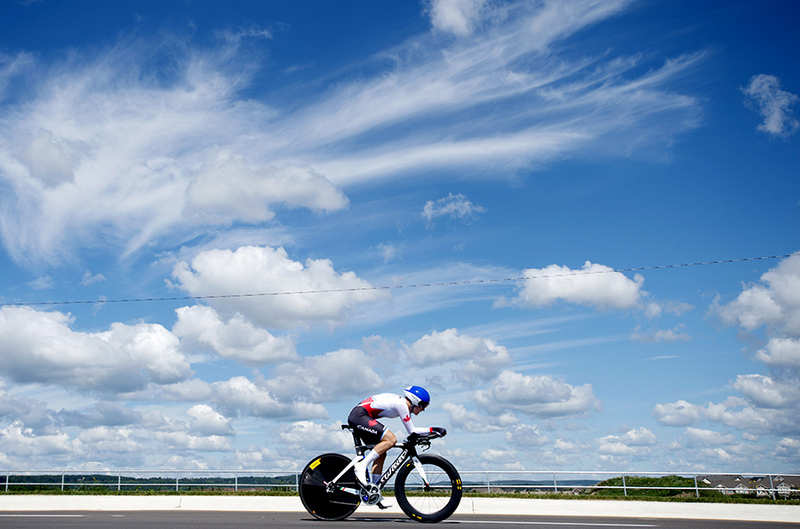 Laura Brown, of Canada, competes in the women’s individual time trial road cycling at the 2015 Pan Am Games in Milton, Ont. 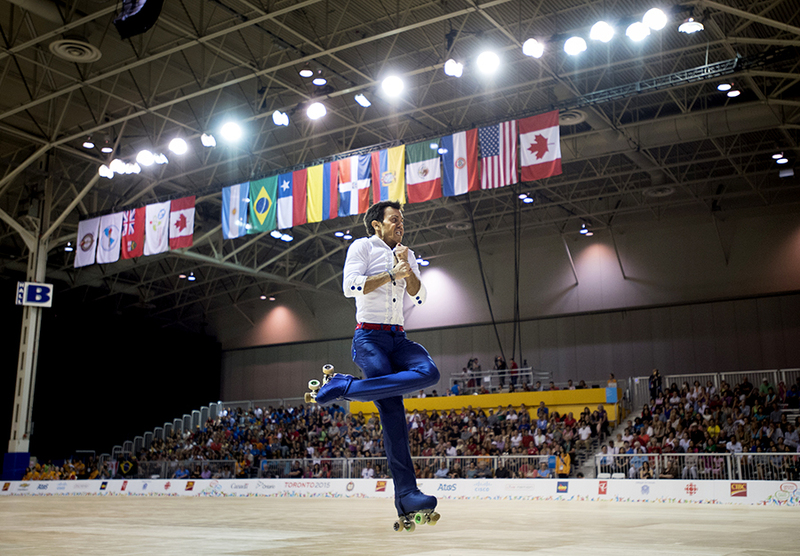 Marcel Sturmer of Brazil performs during the men’s roller figure skating long program at the 2015 Pan Am Games in Toronto. Sturmer won gold in the men’s roller figure skating. 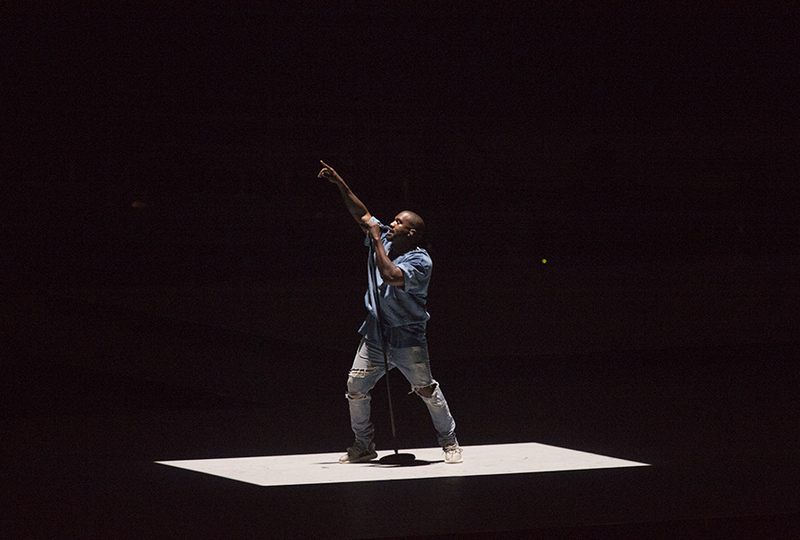 Kanye West performs during the closing ceremony of the 2015 Pan Am Games in Toronto.